A “Roman Catholic Womanpriest” simulates Mass at Holy Wisdom Monastery. Via screen capture from Madison “Call to Action” dissent group website. This post gives me no pleasure, but is really very sad. The former Benedictine Sisters at Holy Wisdom Monastery who left their vows and “went non canonical” sometimes hosts so called “Roman Catholic Womenpriests” at their facility. As implied by the rainbow accoutrements, “Dignity” is a pro-homosexuality organization. I have personally met members of the Holy Wisdom Monastery congregation who were part of “Dignity” and who insistently believed in “women priests”. Joan Weiss mentioned in the text was a Madison “Call to Action” leader. The location isn’t noted on the Madison “Call to Action” dissent group website where I found these images, but is that not the Holy Wisdom Monastery sanctuary? In the following video, Alice Iaquinta says she was accepted into, and graduated from, St Francis Seminary in Milwaukee, where she was honest with them about her intentions to seek “ordination”, and became a “close friend” of at least one of Milwaukee’s real seminarians. Then she underwent an “ordination” ceremony in 2007. Her acceptance into St Francis Seminary was, obviously, on Abp Weakland’s watch, but by the time her “ordination” occurred, the diocese had better leadership. Archbishop Timothy Dolan wrote to Iaquinta prior to her ordination as a deacon (a necessary step preceding priestly ordination) and said she would incur “the gravest canonical penalties” should she continue. “You should not be exercising any liturgical or pastoral ministry in the Catholic Church lest confusion or scandal arise among the people,” he wrote. 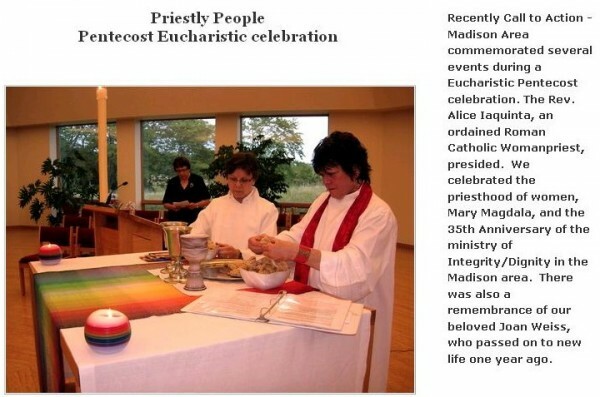 By the way, if you’re wondering whether Ms. Ianquinta will be the “celebrant” at Holy Wisdom’s Ash Wednesday service featuring a reflection by Sr Simone Campbell, I don’t think so; as head of something deceptively titled “St Mary of Magdala Apostle to the Apostles Catholic Church” in Wauwatosa that meets at a Methodist church, she will be busy with some false ecumenism very much like that at Holy Wisdom. 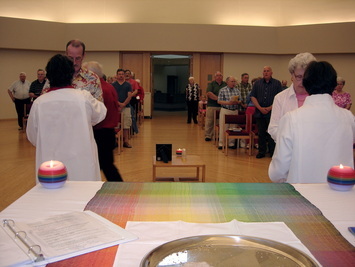 The Mary of Magdala and Wauwatosa Ave. United Methodist Church communities will celebrate a Christian Unity liturgy at 7 p.m. on February 13. Pastor Alice Iaquinta and Pastor Sue Burwell will preside at the liturgy which will honor both Christian traditions to mark the beginning of the penitential journey to Easter. All are welcomed to the communion table. Three things. 1. of course, all this alleged “ecumenism” is revealed as really just interchangeable with protestantism, indistinct from it. 2. men and women are not simply interchangeable, Jesus chose men Apostles only and His Church has no authority to do otherwise, a woman cannot be an icon of Christ the Bridegroom of the Church, and I am offended as a woman by the insistence that women need to do men’s things in order to have dignity. 3. please pray for all. If women can become priests and operate “in persona Christi”, then these women disavow the flesh of Christ. These women disavow the Body and Blood of Jesus Christ, embracing only the soul of Christ and His Divinity.